Ramona Fradon is one of the all-time great comic book artists! I was fortunate enough to meet her in 2018 at the Baltimore Comic Con, and she was a true joy. Ramona Fradon is known by many as THE premier Aquaman artist, having drawn the character for over 10 years and launching Aquaman into the Silver Age of comics. Most of you probably know I’m one-half of the team that produces AQUAMAN & FIRESTORM: THE FIRE & WATER PODCAST. My podcasting partner, Rob Kelly, is responsible for THE AQUAMAN SHRINE. 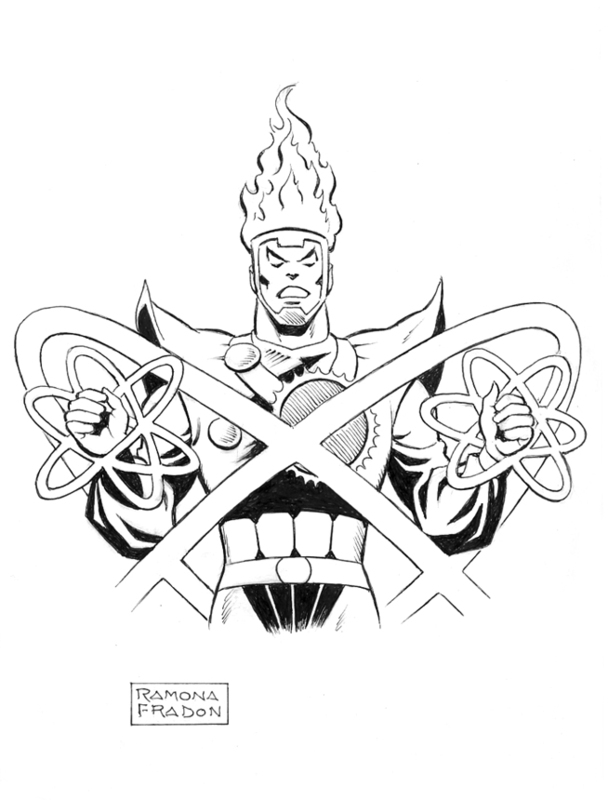 Therefore, this recent commission by Ramona Fradon of Firestorm just blew my socks off! The melding of two of my favorite things! Love this so much!! This is not my commission, but it’s featured over on the Catskill Comics website. Check out their site and you can order your own Ramona Fradon commission! My thanks to Darrin & Ruth Sutherland for the heads-up about this piece! Support Firestorm (and Ramona Fradon)! 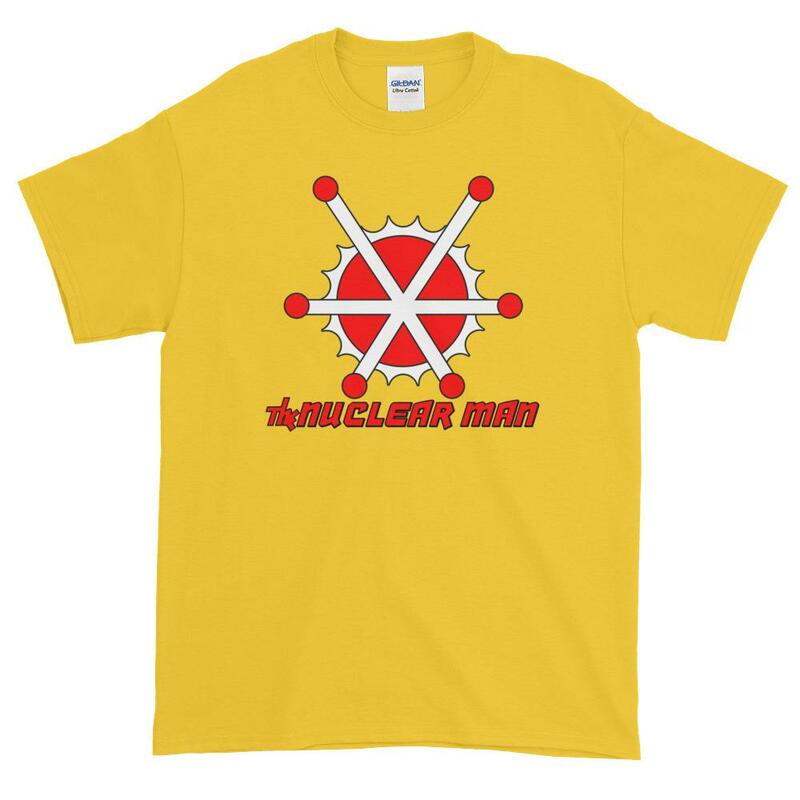 Fan the Flame! Warning, the following contains SPOILERS for Doomsday Clock #8 & #9. 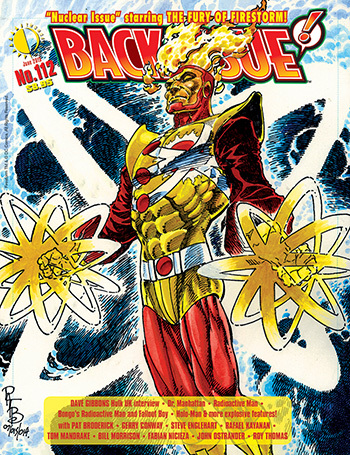 There were major Firestorm-related plots and revelations in these issues. I recommend you read the issues yourself before reading my commentary. Reading Doomsday Clock #8 left me concerned that Firestorm might be permanently damaged as a character. Reading Doomsday Clock #9 just left me mad as hell. Let me start by saying I realize this story isn’t finished yet. Therefore judging the overall story would be wrong; doing that before reading the ending is always a mistake. 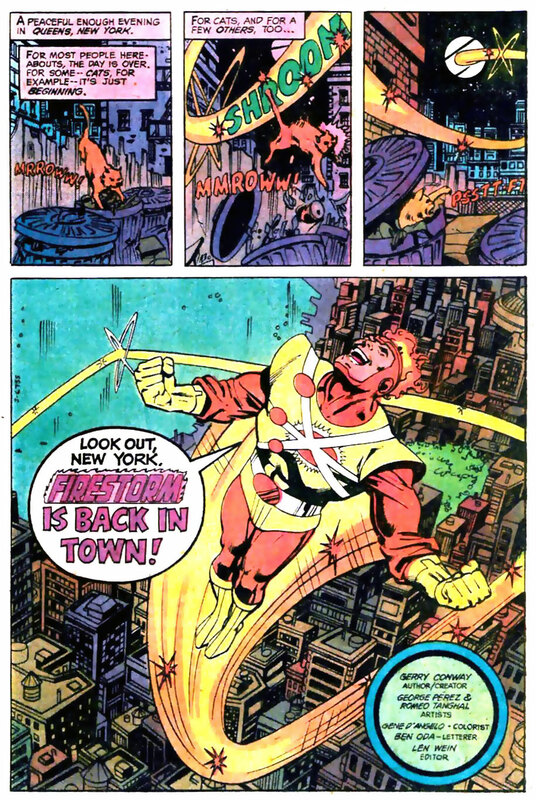 Instead I’m providing my commentary in regards to Firestorm’s activity in the story so far, and some speculation on the future direction of the Firestorm arc. Fair warning, this is gonna be a long one. You should really read the issue itself, lots of Firestorm stuff in there (even Pozhar, now looking like the awesome Elemental Firestorm design!). 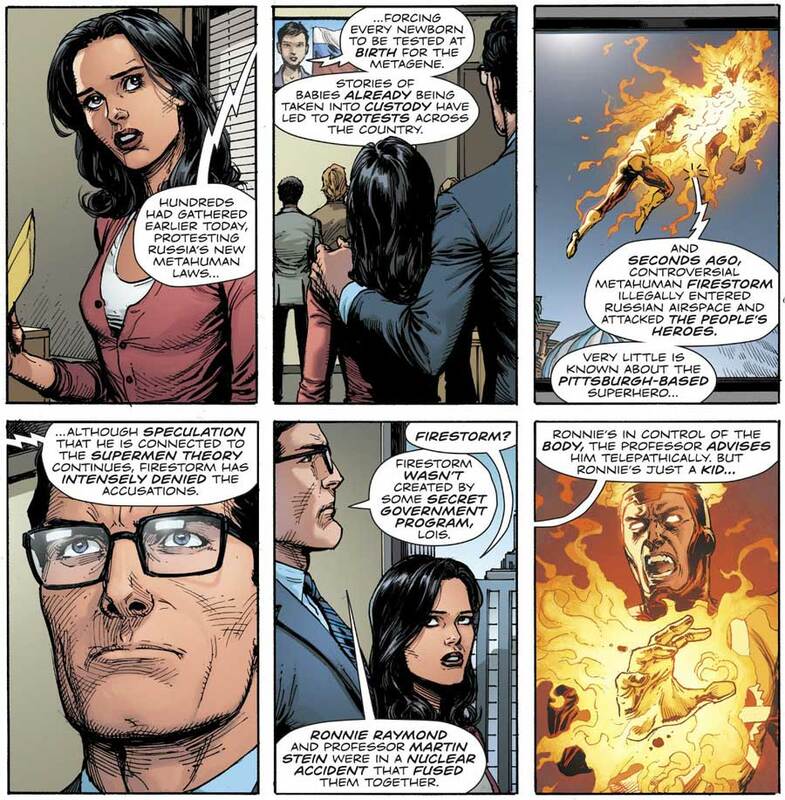 The short version is Ronnie Raymond decides, against Professor Stein’s recommendation, to fly to Russia to confront those accusing Firestorm of being part of the “Supermen Theory”. The “Supermen Theory” is a conspiracy theory finding momentum that many superheroes were created as part of some secret government program. Posted in: Doomsday Clock, Geoff Johns, Professor Martin Stein, Ronnie Raymond. The 227th episode of AQUAMAN AND FIRESTORM: THE FIRE AND WATER PODCAST is now available for your listening pleasure! A proud member of the FIRE AND WATER PODCAST NETWORK! You can find the 227th episode of AQUAMAN AND FIRESTORM: THE FIRE AND WATER PODCAST on iTunes. While you’re there, please drop us a review on the iTunes page. Every comment helps! Don’t use iTunes? Click here for the RSS feed to use with your podcast catcher. Opening theme, “That Time is Now,” by Michael Kohler. Closing theme by Hanna-Barbera. This episode brought to you in part by InStockTrades.com! Posted in: Cartoons, Super Powers Collection. Mark L. Taylor, voice actor who played Firestorm and Ronnie Raymond on the SUPER FRIENDS animated series, was in V: THE FINAL BATTLE! I had no idea until today!! Mark played the character of Fred King, a resistance fighter that helped Juliet Parrish after she unmasked John on national television! Click here for a clip featuring Mark Taylor as Fred King! I love Firestorm! I love “V”! Two great tastes that taste great together! Mark L. Taylor has also appeared in a zillion other favorites, such as CHiPs, Moonlighting, M*A*S*H, West Wing, Tail Spin, Pup Named Scooby Doo, the 1988 Ruby Spears Superman animated series, and so much more! Support Firestorm! Fan the Flame! And V for Victory! The 225th episode of AQUAMAN AND FIRESTORM: THE FIRE AND WATER PODCAST is now available for your listening pleasure! A proud member of the FIRE AND WATER PODCAST NETWORK! 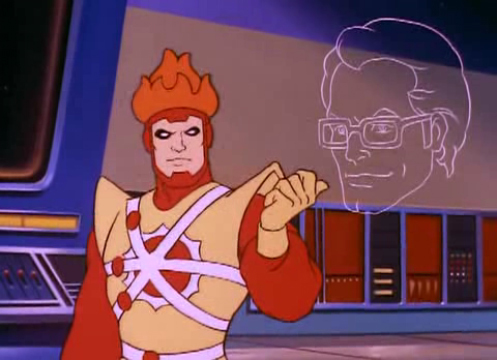 You can find the 225th episode of AQUAMAN AND FIRESTORM: THE FIRE AND WATER PODCAST on iTunes. While you’re there, please drop us a review on the iTunes page. Every comment helps! Don’t use iTunes? Click here for the RSS feed to use with your podcast catcher. Opening theme, “That Time is Now,” by Michael Kohler. Special thanks to Daniel Adams and Ashton Burge with their band The Bad Mamma Jammas for our fantastic original closing theme! This episode brought to you in part by InStockTrades.com! The 224th episode of AQUAMAN AND FIRESTORM: THE FIRE AND WATER PODCAST is now available for your listening pleasure! A proud member of the FIRE AND WATER PODCAST NETWORK! Shag and Rob concentrate on the “fire” part of the Fire and Water Podcast by talking about some classic Firestorm comics! They take a look at FURY OF FIRESTORM ANNUAL #3, FURY OF FIRESTORM #41-47, and BLUE DEVIL #23! Revisiting the CRISIS tie-ins, return of Typhoon, and the Blue Devil crossover! Plus YOUR Listener Feedback! You can find the 224th episode of AQUAMAN AND FIRESTORM: THE FIRE AND WATER PODCAST on iTunes. While you’re there, please drop us a review on the iTunes page. Every comment helps! Don’t use iTunes? Click here for the RSS feed to use with your podcast catcher. Posted in: Comic books, Firestorm #01: Original (Ronnie/Martin), Firestorm comic vol. II, Gerry Conway, Joe Brozowski, Podcast, Professor Martin Stein, Rafael Kayanan, Rogues Gallery, Ronnie Raymond.